Internal Verizon BlackBerry Storm Talking Points | BlackBerry Blast! 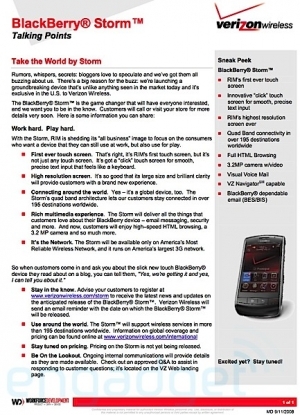 An internal Verizon spec sheet and talking points on the BlackBerry Storm has been leaked. Engadget posted the document today. According to the document the 9530 BB Storm will feature the click touchscreen with tactile feedback. It will also include a 3.2 megapixel camera. The Verizon BlackBerry Storm will include GSM for those customers who need GSM compatibility around the world. No pricing information has been released.